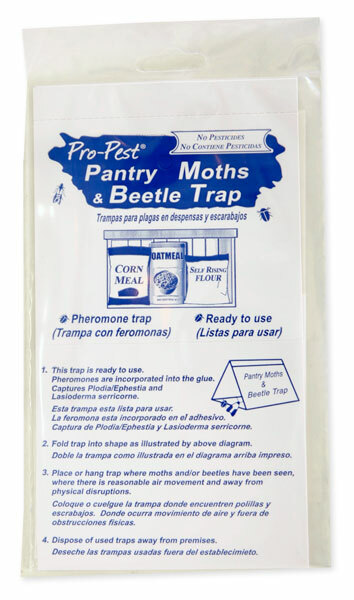 I purchased the Pro-Pest Pantry Moths & Beetle Trap for red flour beetles and they didn't work. I purchased the Pro-Pest Pantry Moths & Beetle Trap for red flour beetles and they didn't work.We continue to see new beetles yet only one beetle caught in the trap. My son made his own small trap out of a 1 oz plastic container with 2 grains of rice in it and caught 5-6 of the beetles by placing them next to your trap. I am dissatisfied with my purchase, needless to say. We thought that we would have our problem solved or at least contained. Wow- I'm sure glad I spent $30 to catch 1 beetle. And for your dismissive answer. We did all the things in the article except for spray everything- we can't. I will not purchase a spray from you at this pint anyways. The beetle trap seems to have been "out of date" anyways. But thank you for your flippant reply. All I was saying is that you can't expect the trap to do all the work for you. You mentioned that you can't spray. Spraying everything is not required. Spraying where the beetles are infesting is required in most cases. Also going through the food and finding out what is infested is also required. Have you done any of this? Also these traps are direct from the manufacturer last month. There is NO expiration date on them either. These traps should last 3-5 years in an unopened package. Not sure where you are getting your information. I am more than happy to refund your money if you are unhappy with our service or my response. Of course we did that. We vacuumed, removed the bags from each vacuum after we vacuumed, inspected and vacuumed again and removed those bags. We removed all didn't go though all food- we REMOVED all food and replaced it. There is a printed date from 2017 on our traps. It is in very light printing, but, it is there. If the traps are not working I can only assume this is an expiration date. Sorry for the typos. I didn't buy them last month. I bought them on October 24th, 2018 so I have given them plenty of time to work. The date / time / batch code you saw is the date of manufacture. As I mentioned these traps are good for up to 5 years. There actually is no expiration date. I can understand why there is confusion on this code. A lot of professional use products have this code called a DOM or REL date. Date of manufacture or Release date. If the beetles have infested any food product in your pantry, the only way to know is to open the package and inspect it. This means opening the package and in some cases dumping the entire contents into a bowl. Flours, especially wheat flour or bread flour, dog food, bird seed and some spices are the most common. But they can get into anything, even popcorn. You will never solve the problem until you find the source of the infestation and get rid of it. Using traps is for monitoring only. It just lets you know if the problem still exists. I can't recall in over 20 years of selling this particular trap that there was ever a problem. We have sold a lot of traps too. The JF Oakes company is great and this trap is one of the best on the professional market. If you are still unhappy with your purchase I will refund your money if you send me the traps. Thank you. I'm going to make something clear- I already told you that we REMOVED ALL FOOD. There is no food to inspect. All new food is placed in the freezer on a different floor of the home now. I find it hard to believe that there was only a single solitary male in all the bugs that we have found. What a strange anomaly in all of the insect kingdom that your traps have never ever not worked in the history of mankind and our infestation just happened to have only one male. I will have to pass on the refund simply because I don't want to spend another $10 to ship them back only to have you tell me that all the traps aren't there since we have used and/or discarded one or two of them so I go thru the trouble of doing all that for a refund of 73 cents. You should be ashamed of yourself. "We removed all didn't go though all food- we REMOVED all food and replaced it." No mention that it was put into another room. You still didn't say if you applied any residual pesticide. Freezing the food won't work. These beetles have been around for over 200 million years and survived multiple ice ages. Putting the infested food in a freezer won't kill them nor will it remove the contaminated or spoiled contents. You need to go through the foods and find out what is infested and get rid of it. Now you are telling me you threw away half of the traps you purchased. Since these traps last several years why would you throw them away if they were empty and clean? I am happy to refund money on traps that you return, and it won't cost $10 to send them back. We need to determine what the species of beetle is what food(s) it is infesting. Without that, you will never solve this problem. NEW-read my response- NEW-NEW NEW NEW food is put into the freezer. Why would I put food from an infested room into the freezer? I THREW AWAY ALL THE FOOD FROM THE ENTIRE AREA, FLOOR AND HOME WHERE THERE WERE BEETLES. IS THAT CLEAR ENOUGH FOR YOU? WE PUT UP 2 TRAPS AND CAUGHT ONE BEETLE WITH BOTH. MY SON CAUGHT 5-6 WITH A SMALL CONTAINER NEXT TO YOUR TRAP. THERE ARE FOUR TRAPS LEFT. I DO NOT WANT TO SEND BACK FOUR UNUSED AND TWO USED TRAPS AND SPEND ANY AMOUNT OF MONEY ONLY TO HAVE YOU SAY THAT I WILL RECEIVE A PARTIAL REFUND BECAUSE TWO OF THE TRAPS ARE USED. AND YES IT WILL COST $10 BECAUSE IF I DON'T SEND THEM CERTIFIED MAIL YOU WILL SAY YOU NEVER RECEIVED THEM SO I NEED PROOF THAT YOU DID. I ALSO KNOW WHAT SPECIES IT IS. IT IS THE RED FLOUR BEETLE. I DID QUITE A BIT OF RESEARCH AND I KNOW YOU THINK I AM AN IDIOT BUT I AM NOT. I THINK IT'S QUITE EVIDENT YOU ARE NOT AN HONEST BUSINESS MAN OR AT LEAST NOT A GOOD PERSON. I WILL NOT WASTE ONE MORE MINUTE ON YOU BUT KNOW THAT EVEN THOUGH YOU PROBABLY THINK THAT YOU ARE CLEVER OR FUNNY, MOST PEOPLE DON'T APPRECIATE BUSINESS OWNERS WHO TREAT THEIR CUSTOMERS LIKE THIS. I WILL LAUGH AT YOU EVERY TIME I USE SOMEONE ELSE'S PRODUCT TO ELIMINATE THE BEETLE'S AND WHEN I CRUSH THEM I WILL IMAGINE YOU PROBABLY HAVE THAT STINKY PUNGENT SMELL AS WELL. GOOD BYE. I am more than happy to refund your money on traps new or used. I just need to see them. If you stick them in an envelope and mail them, it will only cost a couple of dollars. If you don't want to do that I can send you a pickup label or stamps. I have been in this business for over 40 years, and never had a discussion like this. Can you give me your name, order number or email so that I can research your order history?